Oaklins has a strong record of thought-leadership. Through white papers, industry events and analyst reports, Oaklins moves the discussion forward on the topics that matter most to our clients. We give sellers and buyers a sense of context and perspective which guides their strategic decision making. Oaklins’ horticulture specialists regularly publish newsletters about merger and acquisition developments in the industry. Download our recent whitepapers below. 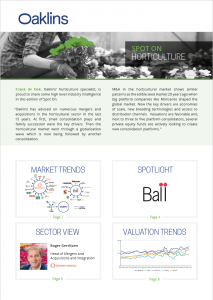 The first edition of the Horticulture Spot On whitepaper zooms in on the drivers behind the market consolidation in the flower and plant breeding market. You will find an overview of the most active consolidators, valuation trends, an analysis of Ball Horticultural Company’s acquisition history as well as an interview with Roger Gerritzen, Head of M&A and Integration at Dümmen Orange. In the second edition of Horticulture Spot On, our specialist Frank de Hek zooms in on the consolidation trends in the mid-market plant care sector. You will find an overview of the evolution amongst the larger players and mid-market players, valuation trends, an analysis of the Norwegian headquartered Yara having more than doubled its turnover as a result of both organic growth and acquisitions; followed by an interview with Joep Wiegel, former CEO of Chrysal.